Silverwood Lake was named for W. E. “Ted” Silverwood, a Riverside County resident whose support for the State Water Project, and his unceasing work for water and soil conservation, helped to bring water to southern California. Supplying water and power for California’s agriculture, cities and industry, the Water Project also provides flood control, recreation, and the protection and enhancement of fish and wildlife. The lake waters begin in California’s upper Feather River Basin as rain or snowmelt. From the water storage facility at Lake Oroville the water is released in regulated amounts, flowing down the Feather and Sacramento Rivers to the Sacramento-San Joaquin Delta and into the 444-mile California Aqueduct. The water moves south to the foot of the Tehachapi Mountains. It enters southern California on the south side of the Tehachapis, then splits into the west branch serving the Los Angeles Basin and Ventura County’s coastal areas, and the east branch, which serves the Antelope Valley and San Bernardino, Riverside, Orange and San Diego counties. In the Antelope Valley, the water level is pumped to a height of 3,480 feet above sea level, then downhill, under the Mojave River and Highway 173, and finally, it reaches Silverwood Lake. From the intake towers at the south end of Silverwood Lake, the water continues south, where it plunges 1,600 feet to spin the turbines that generate electricity. 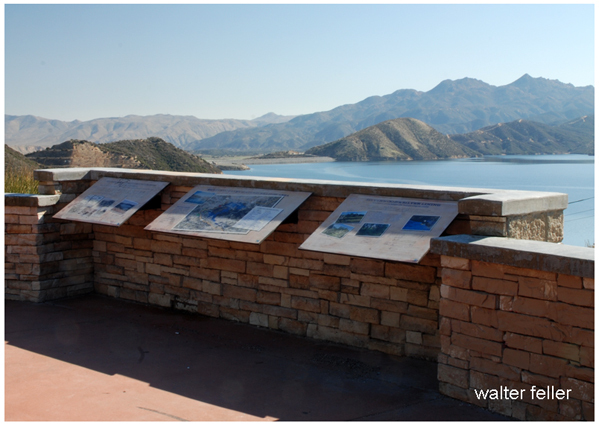 Some of the water goes to contracting agencies, while the rest flows on to Lake Perris, the southern terminus of the aqueduct.